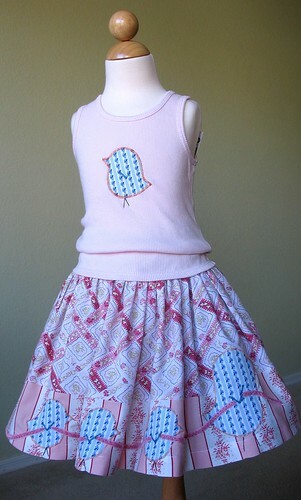 A tweet little outfit - Stop staring and start sewing! I love the way these fabrics don't match but look great together. The little birds remind me of the ones on the Partridge Family bus (C'mon get happy!). The mommy bird is proudly leading the babies around with a velvet ribbon and the last baby is just kind of dragging the ribbon behind him. I stitched around each bird with a bright orange to make them "pop" (most overused phrase of the last decade, but hey, it works). Oh, and I just love the way their little stick legs turned out (I can hear the little "click, click, click" as they walk). 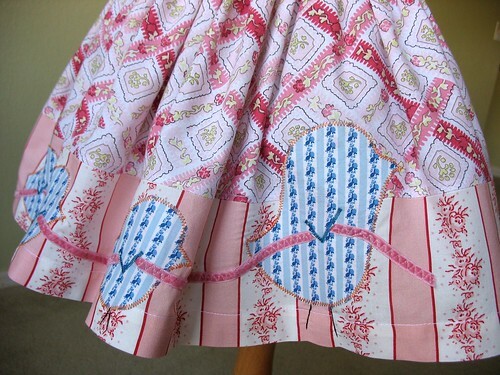 This would actually be kind of cute on a grown up girl's skirt, don't you think? Anyway, I'm working on some super great stuff and hopefully will take a break from sewing for money soon so I can tend to my begging children who are walking around in threadbare clothing (it's getting a wee bit embarrassing).